Kokanee recently launched a new series of beer cans that depict trail maps of Western Canadian ski destinations including Whistler Blackcomb, Marmot Basin, Cypress Mountain, Fernie Alpine Resort, Kimberley Alpine Resort, Lake Louise, Red Mountain Resort, and Mount Washington Alpine Resort. Complete with QR codes, you can also scan the cans to get the trail maps instantly on your phone. 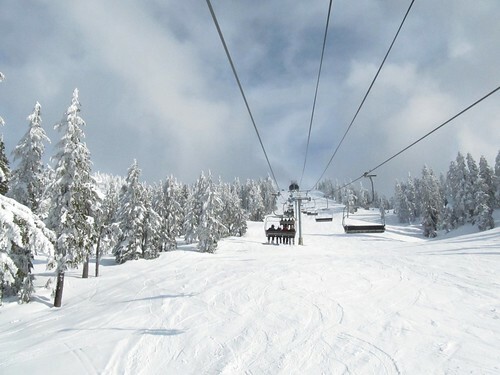 With the weekend coming up, it’s a friendly (and timely) reminder that although grey skies are moving in on Vancouver, you can still get outside and enjoy some early spring activities, such as carving up the powder at any of these fine destinations. I will draw one winner on Tuesday, March 29th, 2011 at 12:00pm. There is no purchase necessary and you must be 19 years or older to participate in this Kokanee giveaway. Please enjoy responsibly. Contest is open to residents of BC. Update The winner is A.J. (@gluttonwithacam) – congratulations! Grew up on Mount Washington, got a taste of Whis awhile back and have been addicted ever since. You just can’t compete with that much terrain. Whistler Blackcomb for the mountain depicted. Great prize! Lake Louise is one place I have never skied, but would love to! Cypress mountain is one, I love Kokanee! Love the local mountain… Cypress! My brother in law swears by Kokanee. I’d love to win this for him! Whistler Mountain is one of the featured mountains. Fernie Alpine Resort. To be original! Whistler Blackcomb of course. Where is the love for Mount Seymour though? Great prize, skied there once about 30 yrs ago. Whistler Blackcomb – of course! Would love to ski Whistler Blackcomb again! It’s been too long! I have ultra fond memories of whistler blackcomb so that’s my pick! Lake Louise is a great mountain for the whole family. Awesome place to ski! Whistler Blackcomb!!!! Whistler Blackcomb – been but haven’t skied there – YET! Marmot Baisin was the hill I learned on. I enjoyed 1 day at Whistler and also Cypress. I’d love another! Backcomb. I want to get up there!